12.10.18 16:57 Account Receive +5.00 Received Payment 5.00 USD from account U18384461 to account U4731311. Batch: 239152191. Memo: API Payment. ELLAOS LTD withdrawal transaction. 12.11.18 19:55 Account Receive +5.00 Received Payment 5.00 USD from account U18384461 to account U4731311. Batch: 239285613. Memo: API Payment. ELLAOS LTD withdrawal transaction. 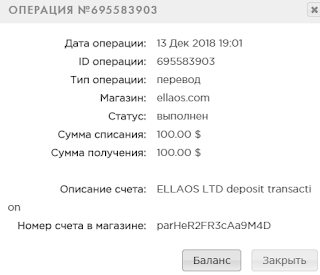 12.13.18 20:06 Account Receive +5.00 Received Payment 5.00 USD from account U18384461 to account U4731311. Batch: 239489022. Memo: API Payment. ELLAOS LTD withdrawal transaction. 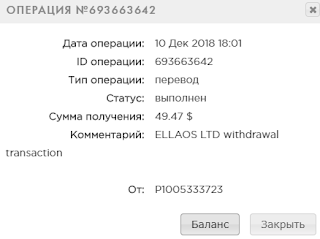 12.14.18 21:33 Account Receive +5.00 Received Payment 5.00 USD from account U18384461 to account U4731311. Batch: 239587401. Memo: API Payment. ELLAOS LTD withdrawal transaction. The amount of 2.5 USD has been deposited to your account. Accounts: U18384461->U2917300. Memo: API Payment. ELLAOS LTD withdrawal transaction.. Date: 03:16 15.12.18. Batch: 239598106.